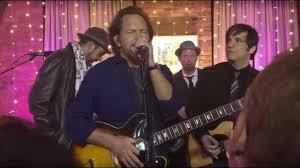 Pearl Jam frontman Eddie Vedder performed the Bob Dylan classic, “All Along The Watchtower”, with The Tangiers Blues Band at the Tribeca Grill in New York City on April 21, and video of the surprise appearance is streaming online. The rocker began the evening by taking his mother, Karen, to see Bruce Springsteen perform his “Springsteen On Broadway” show at the city’s Walter Kerr Theatre in celebration of her 75th birthday. Following the show, Vedder and company dropped in to see friend and celebrity photographer/filmmaker Danny Clinch perform with his band at the Tribeca Grill during an event for the Kristen Ann Carr Fund, which raises money and awareness in the fight against sarcoma, a form of cancer. Carr, the daughter of Springsteen co-manager Barbara Carr and rock journalist Dave Marsh, died of the disease in 1993 at the age of 21. Vedder took the stage with Clinch and the band for the Dylan classic on a night that also saw guest appearances by Springsteen and Jackson Browne. Pearl Jam will begin a European tour in Amsterdam on June 12 before playing a series of select US stadium concerts in August.